If the title of this book appeals to you, then the introduction alone is worth the price of admission. Donald Asher highlights the first book of the same title, and explains what’s new. 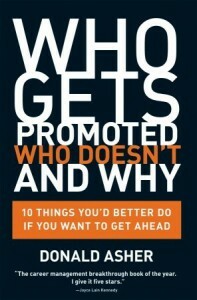 Most importantly, he reveals some of the best advice of the whole book: “the biggest mistake employees make is to think that promotions are given based on past performances.” I started this book almost two months ago, took a break, and am now just finishing it. In that time, I have seen two people passed over for promotion because of this assumption. What’s new in this version? Well, I didn’t read the first book, but according to Asher, he’s updated this book for considerations of females in the workplace (especially giving nods to what he says changed his perspective: Sheryl Sandberg’s LEAN IN) and how to repair your career. Both good; both especially needed. Don Asher (can I call you Don?) hits it hard. He figures we “didn’t need the kind of rudimentary advice in other guides.” We don’t need to be told to polish our shoes and fill the status quo. Whatever all that means. We’re professionals, looking to improve ourselves. We don’t need (I’m picturing him saying this) any namby-pamby coddling. In my opinion, it comes off as arrogant. But, I’d imagine tough love is what some folks need. Cut to the chase; don’t mince words. Before the good, here’s the problem: where’s he coming from? So you call someone an idiot for telling someone else over the phone that the boss is in the restroom. Sure, that’s not the most couth approach, but is lying better? And why is lying acceptable these days? It is not okay in mine or Steven Covey’s opinion, but there’s a whole chapter about lies in BUSINESS WITHOUT THE BULLSH T. But I digress. References; footnotes; resources: a good, modern business book has plenty of them. Besides interspersed interviews, I have no idea where Asher is coming from. Now for the good. Asher knows his stuff. Yeah, yeah, I give him beef for not leaving me a footnote trail, but I see the stuff happen in front of me. Folks want to gossip about the boss.Wrong answer. Folks kill themselves doing a good job in their current position. Sounds reasonable, but not promotion worthy. And then there are the cavemen. Or, was that Neanderthals? Either way, Asher’s got your number. It is frank, to the point, and chock-full of advice. Does he promote job bouncing? Yes. Does he promote re-location? Yes. Does he offer advice, even if you don’t want to do either? Still, yes. I think Ten Speed liked my review of THE BEST PUNCTUATION BOOK, PERIOD., (comma after the period? Sure, why not?) because they sent me this to review, too. So, thanks Ten Speed, Crown, and Random House. This book is hard-hitting, almost entirely spot-on.